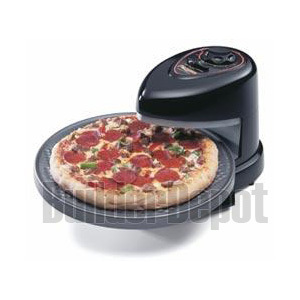 PRESTO 03430/PIZZAZZ PIZZA OVEN/ The fast and easy way to make your favorite pizza! Great for frozen, homemade, take-and-bake, or deli pizza. Recommended for 7-to 12-inch pizzas. Rotating tray continually turns the pizza to assure even baking—top and bottom. Make pizza the way you like it! Top and bottom heating elements can be selected independently for pizza baked-to-order. Make toppings as bubbly and crusts as crispy as you like. With no preheating necessary, the Pizzazz� pizza oven takes frozen pizza from freezer to perfect in minutes. Pizzazz� pizza oven doesn't heat up the kitchen and can save as much as 60% in energy compared to conventional ovens. Removable nonstick baking pan provides easy cleanup and compact storage. 120 volts AC, 1235 watts.